MSD Street Fire HEI Distributor has an advance assembly with coated weights and welded weight pins (not just pressed in like other models). The Street Fire has the same gear that is used on their Pro-Billet models. The metallurgy of this gear has been refined to perform through the harshest conditions. Note: This is a 4 pin module distributor, not for computer controlled 5 or 7 pin applications. Not intended for Extreme RPM or Racing Applications. MSD's value-priced Street Fire HEI distributors are packed with high-quality features and components; including the same gear that MSD uses on the Pro-Billet models. These Street Fire distributors contain a centrifugal advance assembly with coated weights and welded (rather than pressed in) weight pins. Street Fire HEI distributors are supplied with an ignition module and coil that produce a forceful spark, along with a distributor cap with brass terminals; resulting in great performance. Does MSD Ignition 8362 fit your vehicle? 8362 is rated 4.7 out of 5 by 16. Rated 5 out of 5 by Slammer from Outstanding! Fought with an OE unit for over a year: Weights, bushings, springs etc. Hey, beat is beat. I dropped one of these things in the hole and BOOM! Fixed. Spark curve was dead on and the old L82 is running like she should. Rated 5 out of 5 by wem713 from Great Running!!! I have had this installed in a small block Chevy C-10 for a couple of weeks..Engine sounds really good more power and even a slight increase in acceleration.. Rated 5 out of 5 by Lil Bro 5000 from Got on time I have yet to install it. I am still waiting to buy more parts. BUT, I will say that I got the package on time. Everything looks good so far and I look forward to doing more business with Jegs in the near future. Rated 5 out of 5 by Billythekid454 from Big bang for the buck! I purchased this Msd distributor for my 84 chevy k20 pickup. I was having issues with my original hei distributor and couldn't rely on the truck anymore. So i purchased the streetfire distributor and WOW did it wake that 454 up! Night and day difference from my stock hei when it was in good working condition. Way better throttle response, overall performance and easier starting! I definitely recommend this product! 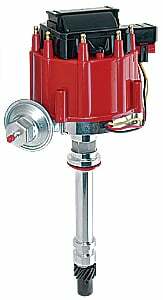 Rated 5 out of 5 by Ricko from MSD Streetfire This distributor was a great buy, made by a great company and of course, sold by JEGS. Installed like a dream, fired up quickly and after a minor timing adjustment, provided smooth acceleration and trouble free operation. Packaging was incredible. Kinda sounds like a commercial huh. It's not....it' just the truth. These distributors are good for 6500+ rpm. I currently have a GM HEI distributor in my 57 Chevrolet 310 truck . Is this a direct fit or are additional wiring and supplies needed? This is not a direct fit for that application, but you will only need a power wire and a ground to make it work properly.